Great Place to Work® Institute honors Winshuttle for their dedication to employee satisfaction and engagement. 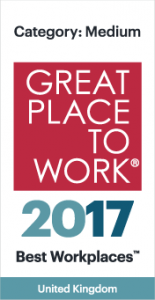 Wimbledon, UK – May 18th, 2017 – Winshuttle is pleased to announce it has been recognized for the third time as one of the UK’s best workplaces by the Great Place to Work® Institute. The company ranked 33rd in its first year competing in the medium category (organizations with 50-499 employees) out of roughly 220-250 companies that were surveyed. As the company continues to grow, their dedication to fostering a culture of respect and innovation strengthens, and empowers employees’ ambitions. Each year, the Great Place to Work Institute recognizes leading businesses in over 45 countries, based on research from millions of employee surveys and an audit of the organizations’ management and HR practices. Winshuttle’s selection in the small business category in years past and medium category this year exemplifies their employee satisfaction and successful workplace culture. The company lives and breathes by their core PACT values, and strives to create an inclusive culture dedicated to innovation.